Congratulations! You win 112 bonus points with this purchase! look for the figure on your prescription written as the 'dioptre sphere'. Beware of a + or - (minus = is replaced). + dioptres with problems with near vision (far-sightedness). - dioptres with distant vision problems (near-sightedness). This is the diameter (or size) of lens. If you have some lenses with a specific diameter that suit you then stay with them. It is not such an important parameter, but a different diameter size would be a gamble. 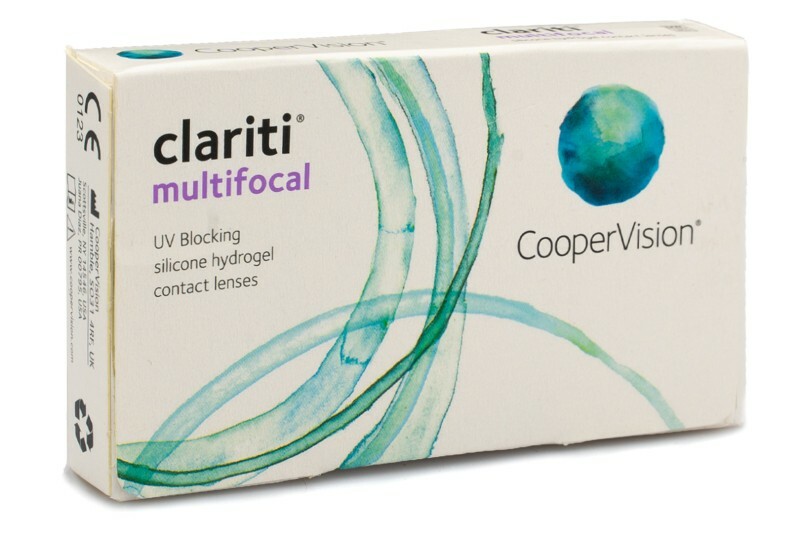 Clariti Multifocal are monthly contact lenses from CooperVision for the correction of presbyopia, which, in addition to the benefits of the silicone-hydrogel material, offer its users an optimized design and unique WetLoc technology that keeps the contacts naturally moisturized and comfortable throughout the day while providing great vision and high wear comfort. They also have a UV filter. Clariti Multifocal monthly contact lenses are designed to be a practical, comfortable and great value, with a wide range of prescriptions to choose from. Designed to give smooth visual transition between near and far vision, these lenses also have an aspheric back surface to ensure a comfortable fit. The Clariti Multifocal contact lenses contain a higher amount of water content, which is the essence of comfortable use of contacts. These unique properties of Clariti Multifocal contact lenses come as a result of the WetLoc™ technology. What usually happens, is that lenses attract and keep the water molecules to their surface and remain moisturized throughout the day. The moisture component is evenly distributed throughout the lens surface and mimics the natural state of hydration of a healthy human eye. Silicone-hydrogel lenses are a healthier alternative to hydrogel lenses. They release more oxygen to the cornea and, because of their high breathability, the eyes stay healthier. Clariti Multifocal lenses incorporate the right balance of oxygen transmissibility, high wettability, low modulus, high water content, and non-surface treatment, producing a lens that provides optimal comfort and corneal health. Clariti Multifocal lenses Advanced Edge Technology provides a lens edge that is incredibly thin, reducing lens awareness and improving comfort. In addition, Clariti Multifocal has UV filters that enhance the protection of the cornea from the negative effects of ultraviolet radiation. However, since contacts do not cover the entire eye or eye area, it's recommended to put on a pair of sunglasses with UV protection.